This entry was posted in Colette Beignet, Stuff I've made and tagged Beignets, Stuff I've made by Joanne. Bookmark the permalink. Oh my god, that is absolutely GORGEOUS! 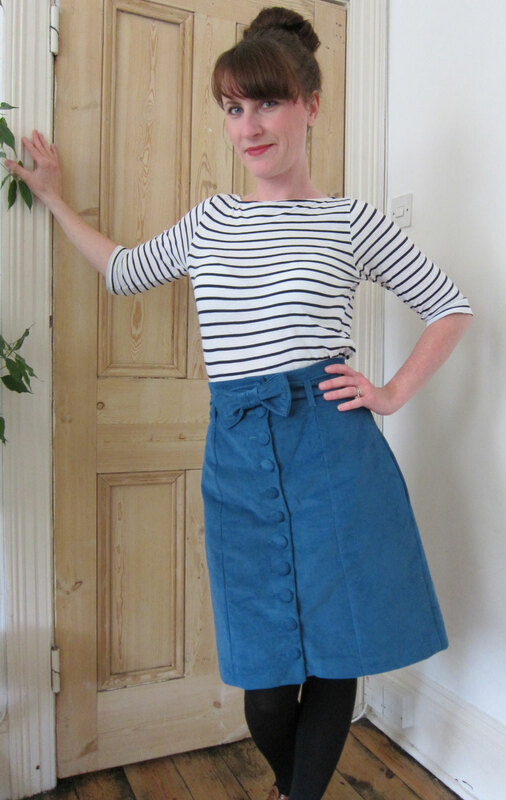 Teal cord – great colour, great fabric. Where did you get it? I think we have the same shoes, by the way! Hey Karen 🙂 Isn’t it a beautiful colour? 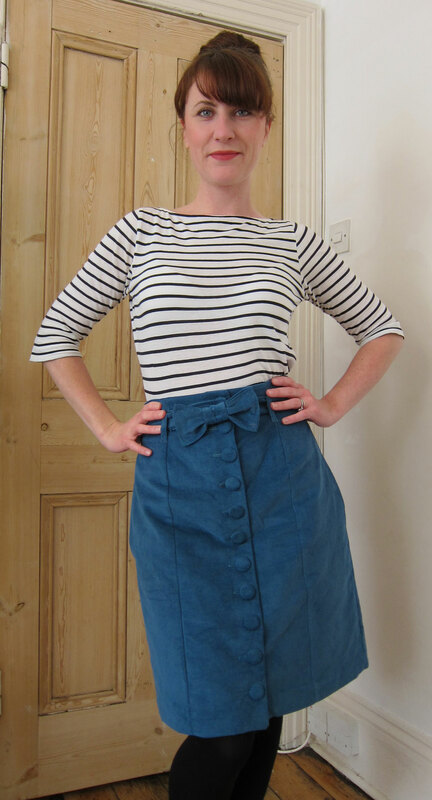 I got it from http://www.trurofabrics.com and to be honest I got enough for the Beignet (according to the instructions) but I have squillions left so am going to use the rest for either another skirt or perhaps a shirt. Heheh we have the same shoes – Office perchance? Comfy and give height but good for my awful bunion feet. Yes, I suffer from the bunions.. it’s a lewsley woman thing…. I suffer from bunions too and these shoes are fabulous for me. Mine are Carvella – perhaps you can get those at Office? I am going to check out that website NOW! Oh my GOLLY! This is just so… perfect! I love it! The corduroy buttons are adorable – were they fiddly to make? 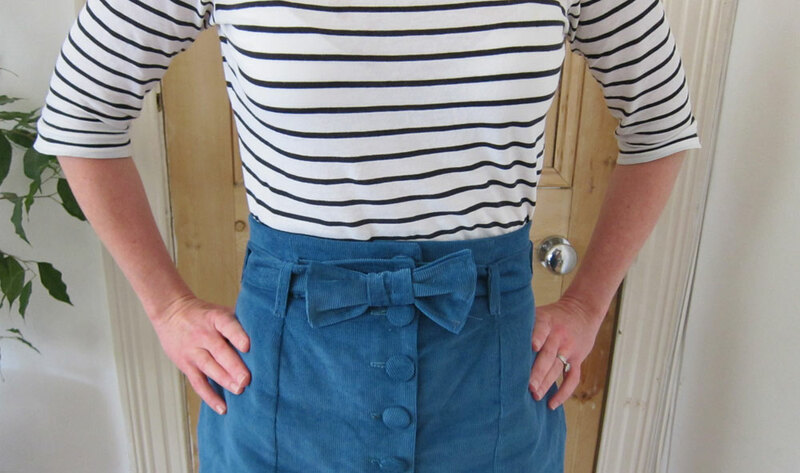 Ooh and I’m so excited you made a bow belt – I’m in the process of putting together a little blog post featuring bow belts people have made. Can I borrow one of your pictures? Email me or leave a comment on my blog to let me know if that’s okay. Thankee Tilly! The buttons weren’t too fiddly – I bought one of those tools for a couple of quid from John Lewis but I’ll be honest – after eight of them I enlisted the husband to start helping as my upper body strength was just gone, plus my hands loooked like I had some awful disease! The skirt is beautiful. I have been looking for corduroy to use for my Ginger pattern. Perhaps I can get a bit extra for the Beignet as well? Again, beautiful skirt. The “Tilly bow” belt was a lovely touch. Awh thanks Mujerboricua! 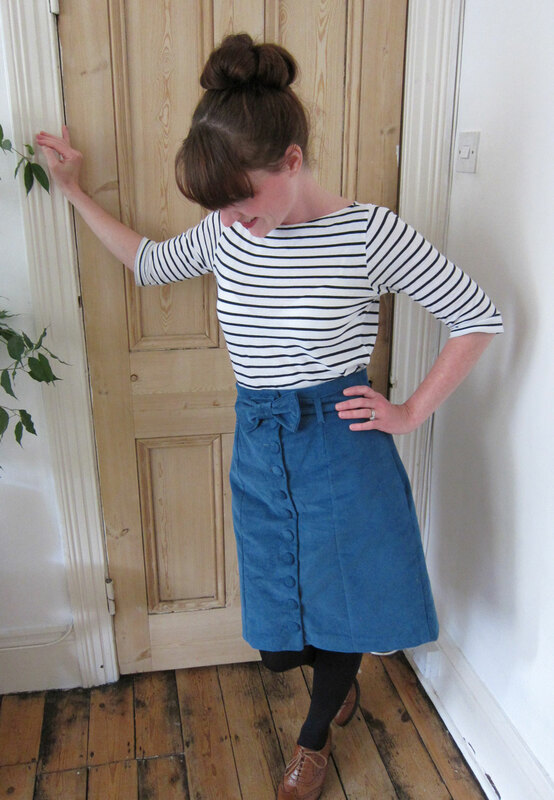 I’ve ordered the ginger skirt pattern now too so am hoping I have enough corduroy left for that too – would be perfect! Lovely! 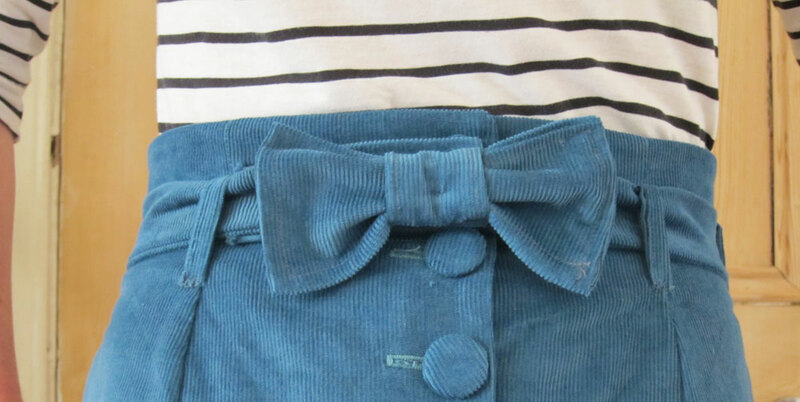 I love the buttons and the bow. Very nice. This is just perfect! Great colour and I love a soft corduroy!!! I’ve loved everyone’s Beignet’s I’ve seen to date, but I’m not convinced it would suit me at all, which is sad. However, after just completing a Ginger muslin, I know that it’s going to become my go to pattern regardless of the season! It’s so easy and quick to make, hope you find the same once you give it a go! Gorgeous! I love this. and I love the teal cord too! I must have some of my own! 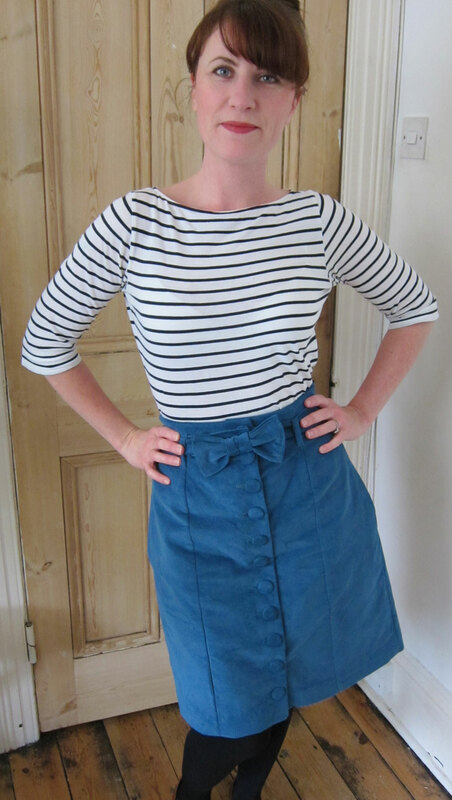 I’m planning on starting my first Beignet in the next week or so – I’ve ordered some navy needlecord – love the bowbelt, so might have to copy you there! I love your skirt, it’s beautiful. I’m really inspired to make one now, after I’ve finished the 3 things I’m in the middle of! Love your blog. Thanks Em! Looking forward to seeing your finished projects and the beignet! I love your beautiful Beignet. I think a cord one would be fabulous for Autumn. I really like you blog by the way . So kind Lisa thank you for dropping by 🙂 Just had a look at your blog – oooh i feel another subscription coming on! Love this skirt. Bravo! 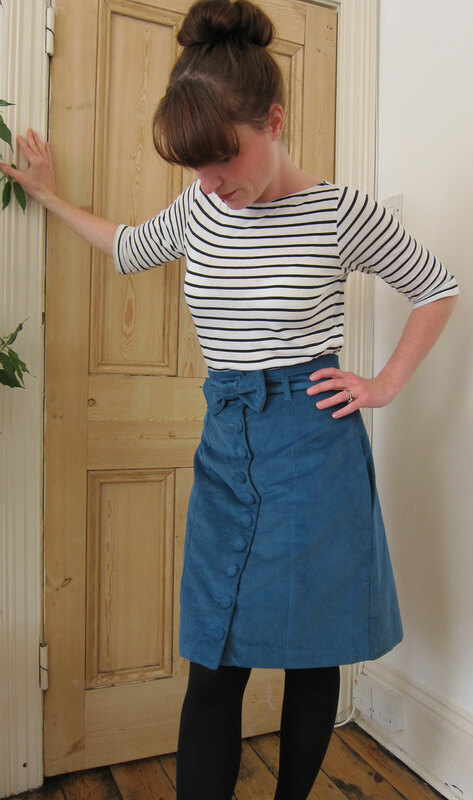 I can see this being an every week kind of skirt!